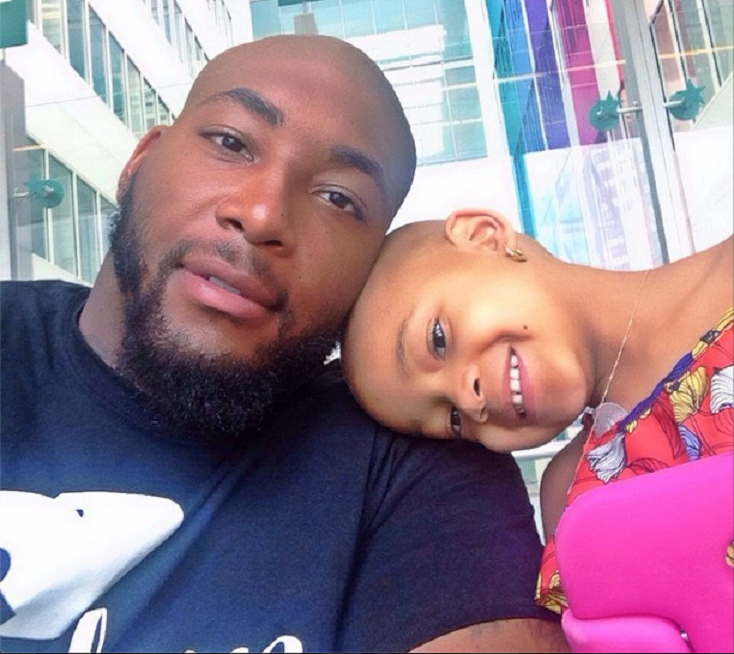 Like most of you, I first heard of Leah this summer right after her father, Cincinnati Bengals defensive tackle, Devon Still was released from the team. What we would all soon find out is that their reason for releasing him was due to the fact that Leah is battling a rare form of pediatric cancer called neuroblastoma. Still came to the conclusion that in order to provide Leah with the care she needed, he would walk away from football. In one of the classiest moves ever by a professional sports organization, the Bengals informed Still that after being cut they would resign him to their practice squad. This move allowed Still to continue to receive health insurance thus ensuring Leah would receive the treatment she needs. Her medical expenses are expected to exceed $1 million and the NFL will cover 100 percent of the costs. A standing ovation is allowed at this moment. The story spread rapidly. During a summer that was plagued with stories of domestic violence and child abuse, this gesture by the Bengals was a breath of fresh air. In an industry where the phrase, “It’s just business,” sours relationships and throws lives onto an emotional rollercoaster, it brought a smile to my face to see the powers that be put aside any thoughts of what can you do for me to view Still as what he is: human. As news of the Bengals decision took over the news mediums, the organization took it a step further. Days after being signed to the practice squad, Still was upgraded to the active roster. After signing him to the 53 man team, the Bengals announced that they would donate all proceeds from the sale of Still’s number 75 jersey to the Cincinnati Children’s Hospital and pediatric cancer research. Within 24 hours, Still’s jersey set a record for the most sales during that time span in Bengals history. Another standing ovation is allowed at this moment. Not only have fans stepped up to the plate but different NFL organizations, players and sports figures have as well. The Philadelphia Eagles sent Leah toys and a basket full of goodies. New Orleans Saints Head Coach, Sean Payton, purchased 100 Still jerseys(in sizes small and medium) and donated them to the Pediatric Care Hospital in Cincinnati. Hall of Famer, Jim Kelly, who was recently went into remission, sent Leah and Devon a personal note along with an autographed football and jersey. Commentators have been photographed holding up signs with the moniker Still wears under his eyes and across the bridge of his nose every game, “Leah Strong.” And perhaps one of the biggest tearjerkers took place on October 5 during the Sunday Night Football game between the New England Patriots and the Bengals. During the third quarter, as a video tribute to Leah and other children battling cancer played on the big screen, the Patriots cheerleaders unzipped their jackets to reveal the fact that they were wearing Still’s number jersey underneath. The cheerleaders had taken a page out of the owner, Robert Kraft’s, book who announced he would make a $25,000 donation to the Cincinnati Children’s Hospital in Leah’s name. Yep. Worthy of another standing ovation. This is what I love about sports. The camaraderie. The selflessness. The unity. As I watched the Bengals take on the Cleveland Browns last night, I smiled. I smiled because I knew that Leah was attending her first NFL game. I smiled because I had seen pictures of her in her Still jersey, adorned with rhinestones as she posed for pictures with the Bengals cheerleaders. I smiled through the tears as cameras caught the touching moment between daughter and father as Leah waved emphatically, from her suite, at her father on the field. And remember those jerseys fans and supporters eagerly purchased? The Bengals, with Leah on the field, presented a check for $1.3 millions dollars to the Cincinnati Children’s Hospital last nigh in her name. You know what to do. Standing o. Whenever you have a moment, say a prayer for Leah, her father, all the little ones battling this disease and their families. Often times, for as much as their little bodies are having to bear, they tend to light up the room. Their “I can beat this” and “One day at a time” attitudes serve as a reminder to us to never give up. We have a lot of fight in us if we are willing to tap into it. In the midst of this ordeal, both Leah and her father have been very inspiring. His Instagram(man_of_still75) posts are filled with positivity, gratitude and love. Still offers up a glimpse of his relationship with his daughter. He gives her pep talks, she beat boxes and dances and they both enjoy life in the now. I admire the strength of this little four year old warrior and I pray that her strength will carry her into a life of remission. Continue to live “Leah Strong” babygirl! We are all rooting for you!